Wonderland: A Play That Shouts "Coal!" 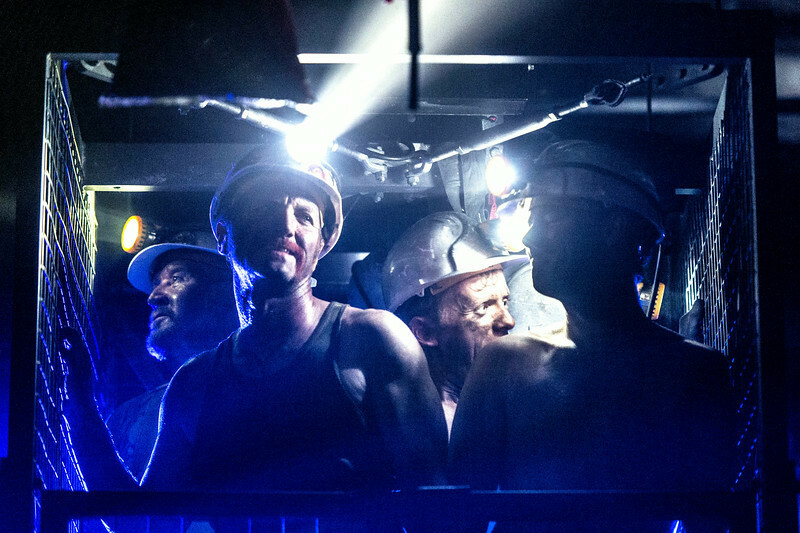 Stuart Black Wonderland: A Play That Shouts "Coal!" This ambitious epic about the 1984-5 miners' strike starts deep in the bowels of the earth then plunges deeper, down into the coal seam where every breath is full of soot, and life depends on the competency and concentration of the man standing next to you. It’s a spectacular vision designed by Ashley Martin Davis to resemble one of Piranesi’s prison etchings, updated with steel grids and pumping hydraulics. And it’s brilliantly lit by Peter Mumford to make you very quickly forget you are actually in a deluxe modern theatre in Hampstead, making you fear instead that all that black dust might just poison your lungs if you breathe too heavily. 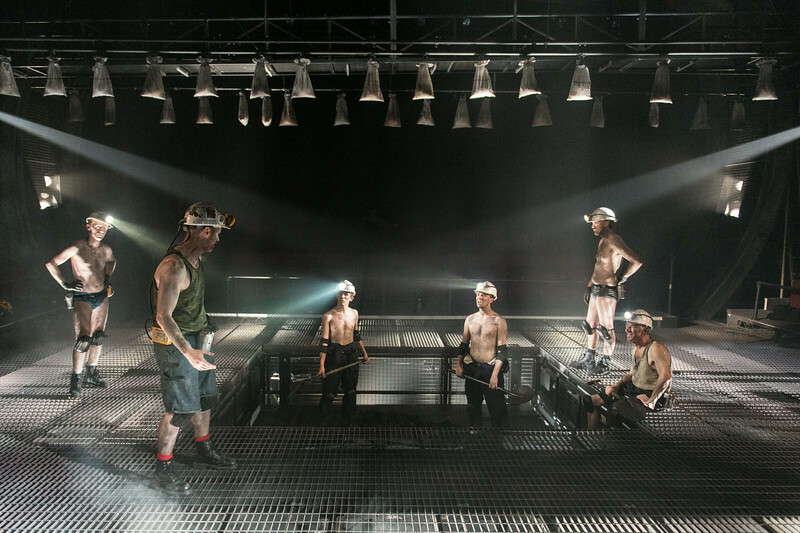 The concentrated industrial atmosphere and juddering sound design (more like ‘thunderland’) brings you up close to the grime-caked miners heaving away at the rock; just as well, as it’s often quite hard at the outset to make out exactly who is who. But characters slowly emerge from the darkness and over the first act the audience gets the sense of a squadron of Northern working men: their camaraderie and seasoned humour, the proud spirit of the veterans and the nerves of the newbies. Jimmy (Ben Ryan-Davies) and Malcolm (David Moorst) apprenticed to Fanny (Paul Rattray) and Bobbo (Nigel Betts) and all under the surly leadership of Colonel (Paul Brennen) make up a compelling company — a bawdy band of merry men. Yet for all the impressive huff and puff, we get precious little story to grab hold of and it's left up to a trio of stiff men in suits to disturb the growing tension and explain the impending political crisis. 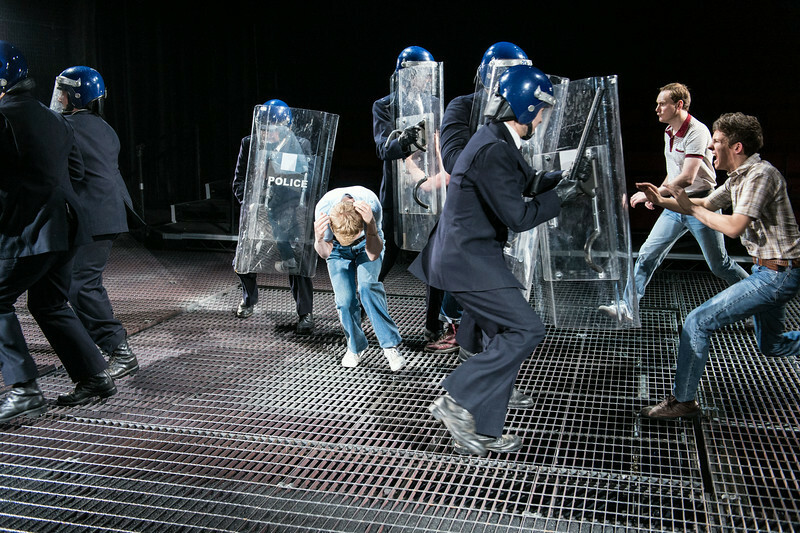 Beth Steel’s script tries hard to tackle the complexity of an event which shook and reshaped Britain thirty years ago but only partially succeeds. By splitting the story between the miners and the men in the ministry we don't get quite enough of either. The characterization remains stubbornly thin: the miners continually romanticised, while the fat cats in pin-stripes never evolve much beyond cardboard archetypes. The digressions to meeting rooms in Whitehall are full of lumpen exposition and the top brass are all either faceless fools or cartoonish creeps: Michael Cochrane as American coal chief Ian McGregor is more like Monty Burns from The Simpsons (especially when he lingers camply on the syllables of Notting-ham-shyer), while Dugald Bruce-Lockhart is ludicrous as government advisor David Hart, arriving in flight jacket and Biggles goggles: funny perhaps, but a sideshow to the real issue of the men in the mine. It’s not really until the second half of the play, when the elaborate underground set is pushed aside and we go ‘up top’ to see the strike begin in earnest, that the human drama finally gels with the historical events at the heart of the story. The question of whether to strike or scab was always going to be the meatiest dilemma, yet even here, the play feels lacking. Truth is, we've seen this story too many times before and it feels that to revisit it now, there must be a different take, a panoramic view that rises above the entrenched politics of left and right. Unfortunately this play only succeeds in fits and starts. The direction by Edward Hall is clever and covers up the holes and problems, yet with such a great set and with eighteen actors working their mucky socks off, Wonderland should really feel like a bruising punch to the guts. Unfortunately, it's all too easily forgotten once you get out into the (relatively) fresher north London air. Wonderland is on at the Hampstead Theatre until 26 July. Londonist saw this play on a complimentary ticket.